Life has been far too busy the last couple years and I haven’t kept up with posting photos from all of my trips. Now, as I’m planning for a couple photography trips this summer and thinking about the night shots that I’m going to try to get, I thought I’d take a moment to share some of my favorite night shots from the past couple years. 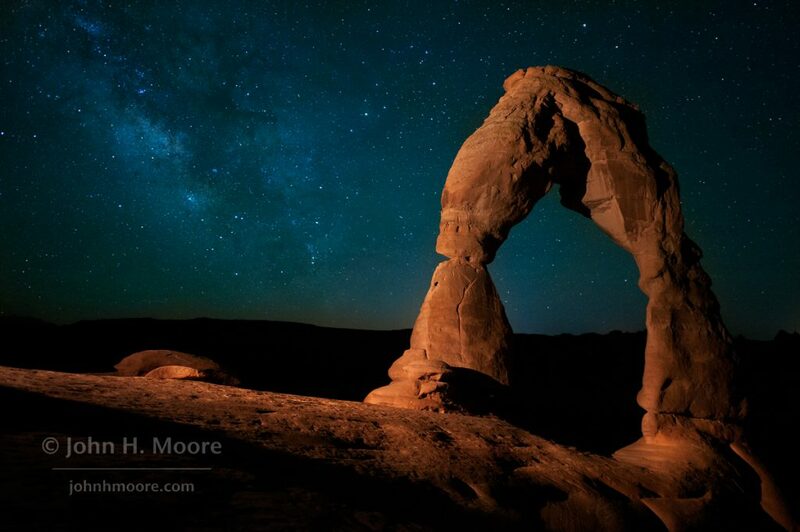 First up is Delicate Arch in Arches National Park with stars behind. Delicate Arch is an interesting place to shoot at night. It’s a considerable hike in and back out, and getting your tripod set up for the “money shot” below the arch requires a willingness to walk down a slope just above a plummeting-to-your-death drop-off that’s mildly sketchy during the day and a whole lot more sketchy at night! This particular shoot was a lesson in being less polite. That night, another photographer had set up several cameras to shoot time lapses and I was being far more concerned about my impact on his shots than he was being about his impact on my shots… and when I was able to process my shots afterwards, I hadn’t really dialed things in as well as I needed to and ultimately didn’t get the shots that I wanted. So one of these days I’ll have to go back and try again! False Kiva in Utah. 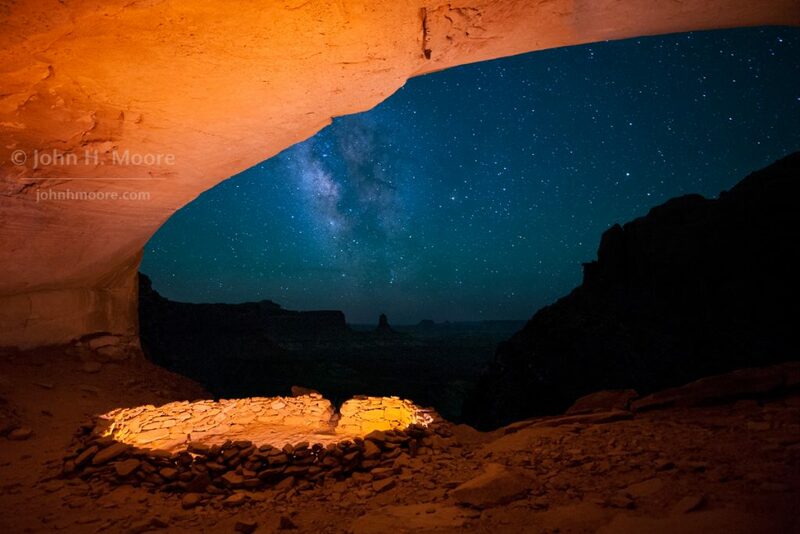 I’d had a night shot at False Kiva on my wish list for some time. Something about the place just spoke to me. The shoot, however, was way on the outer edges of my comfort zone. It involves a one-hour drive from the nearest town, followed by a one-hour hike from your car, then a primitive path halfway up a sheer cliff to a cave, then spending the night alone in that cave in the midst of Native American ruins. More brave people than I might leave the cave and hike back out in the middle of the night, once they’ve gotten the shot, but you may notice a theme that I’m not really in favor of plummeting to my death in the middle of the night when out solo hiking in wild places. I did try to sleep a little in the cave while waiting on my shot, but hadn’t hiked in a cot, the ground was pretty dusty with rodents skittering, and the one big flat rock that I tried out was a bit closer to the cliff edge that really seemed wise for sleeping. It was, however, a great experience and I had a lot of fun experimenting with different ways to light the cave and kiva. 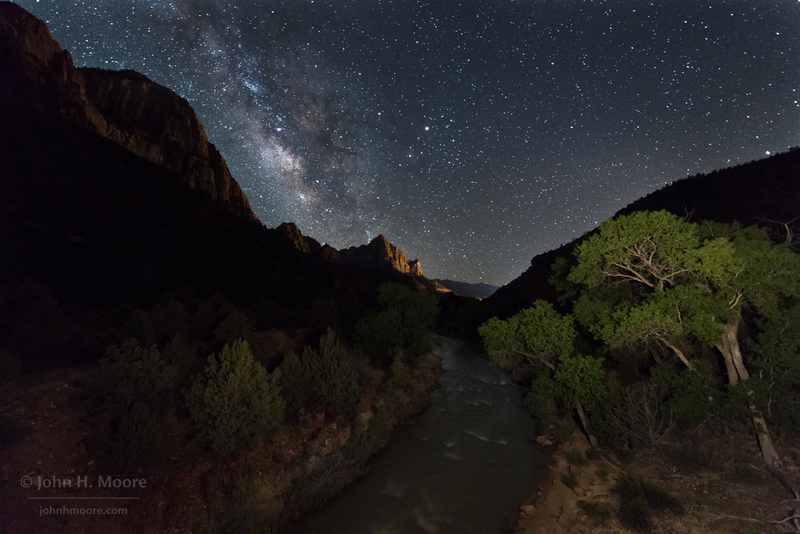 The Virgin River and The Watchman from Zion National Park. Several attempts shown here, from a couple trips. Night photography has gotten a lot more popular. My first try at this shot I had the place to myself and very few people had taken this shot. By my more recent attempts, there was a small gaggle of photographers (I think entirely photography guide and client pairs except for me) on the bridge in the middle of the night and the shot has become more common. This is a theme; it gets harder and harder to find new & unique shots! The classic view of The Watchman from the Canyon Junction Bridge in Zion National Park, where every sunset the bridge is lined with photographers. This photo was taken three hours after all the photographers left. 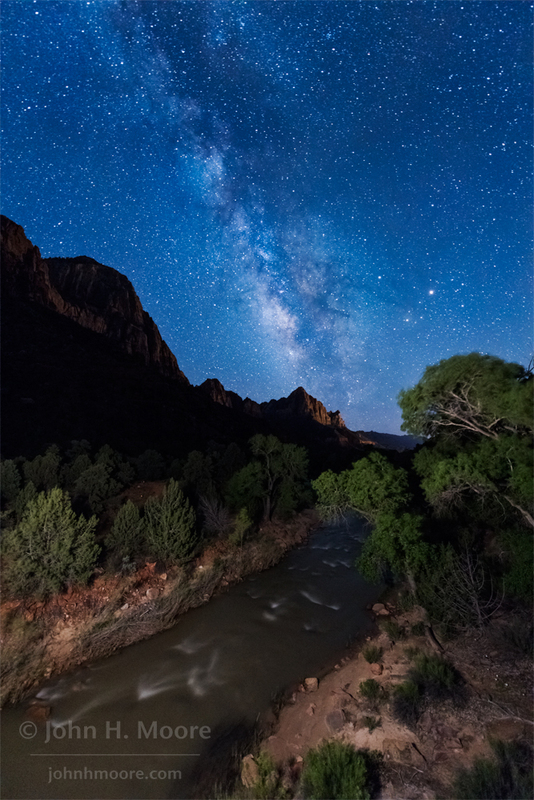 Looking down the Virgin River in Zion National Park towards The Watchman, lit by the lights of Springdale, Utah, under the night sky. 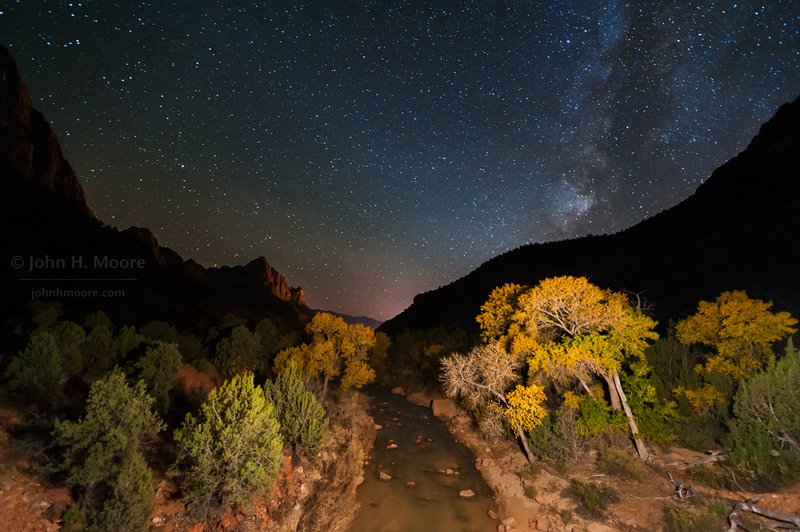 The Virgin River runs down past The Watchman rock formation under a night sky at blue hour. Zion National Park, Utah. Old Faithful Geyser in Yellowstone National Park. Funny story to this shot. Old Faithful erupts roughly every 90 minutes. I wanted full dark, Milky Way arching a bit to the left, and not too many people still out and about–so I chose an eruption somewhere around 11 PM to midnight to head out and attempt the shot. Perfect night, Milky Way in great position. Did a couple test shots before the eruption and all looked good. Eruption started and I triggered my shot. 30 second exposure. 20-25 seconds into my exposure and some nitwit off to the right turns on an absolute canon of a light and paints the eruption. My shot is completely blown out and no way did this bozo get a shot either. If s/he had a long exposure, the shot was blown out. If a short exposure, the stars wouldn’t show. With much grumbling I headed in to the lobby of the Old Faithful Inn to wait another 90 minutes and try the shot again. By that time is would be closer to 1 AM and I would be out there all by myself. Talked with the staff in the Inn and asked if there were ever bears out by the geysers in the middle of the night? “You should see the security footage from a couple nights ago of a grizzly chasing a bison down the boardwalk by Old Faithful,” they said. “Here, you should take this bear spray with you,” they said. No bears, no nitwits with light bazookas for attempt #2. 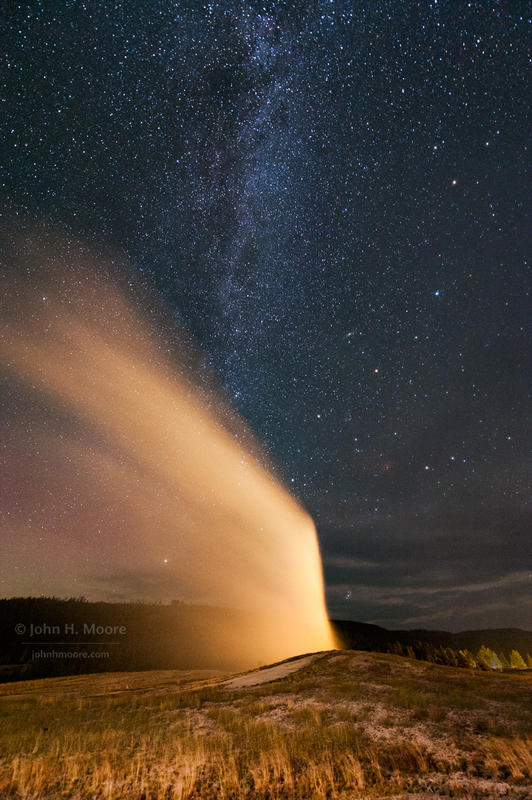 Old Faithful Geyser erupting at night. Yellowstone National Park, Wyoming, USA. Self-portrait of the photographer light-painting Thor’s Hammer in Bryce Canyon National Park at night. Walking down into the amphitheater at Bryce by yourself at night? Sketchy! Silent City at Bryce at night. 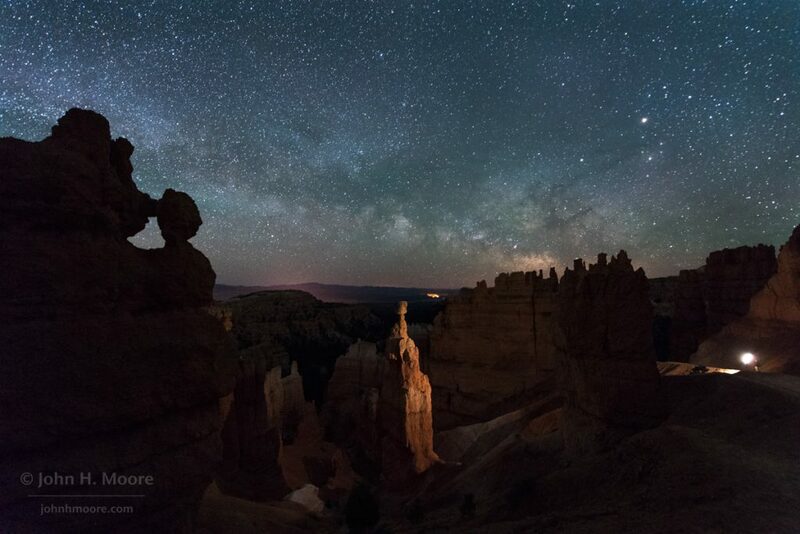 Bryce Canyon hoodoos in the Silent City at night with the Milky Way arcing above. 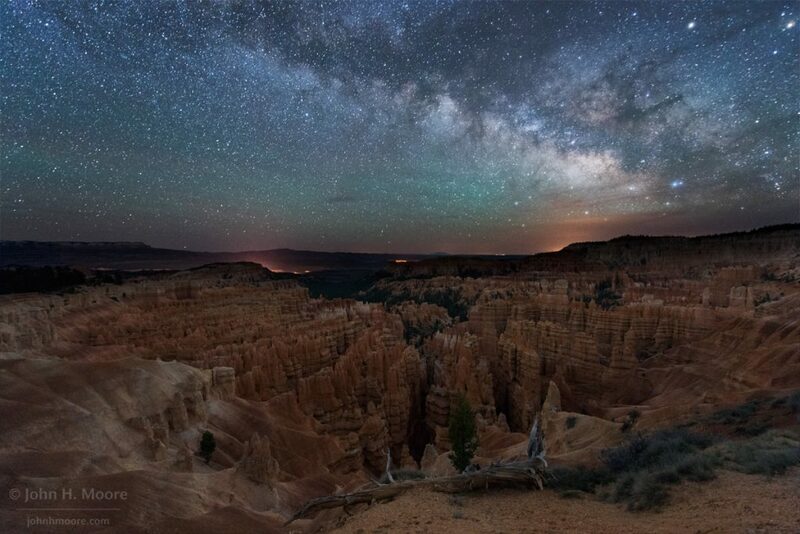 Bryce Canyon National Park, Utah, USA. Two shots at Owachomo Bridge in Natural Bridges National Monument in Utah. First is your classic light-painting shot, second is winning the meteor lottery! On this particular night, there ended up being four of us shooting at Owachomo Bridge–photographer Chris Eaton, two girls whose names I didn’t get and who were having a lot of fun, and myself. I didn’t realize it, but it turned out to be one of the nights of the peak of the Aquariid Meteor Shower. As the night progressed, there were more and more meteors streaking across the sky–but invariably not in camera frame, or when no one was taking a shot, of big beautiful streaks… behind us! Several hours of “did you get it?” “nope!” yelled between the four of us in the dark. Finally, a huge meteor streaked straight through the middle of the bridge and exploded in a visual and sound punch that all of us could feel. Chris and I both started screaming–we’d had our shutters open!!!! The effect of the meteor in person was much, much more than it appears in the shot. We could feel the explosion. 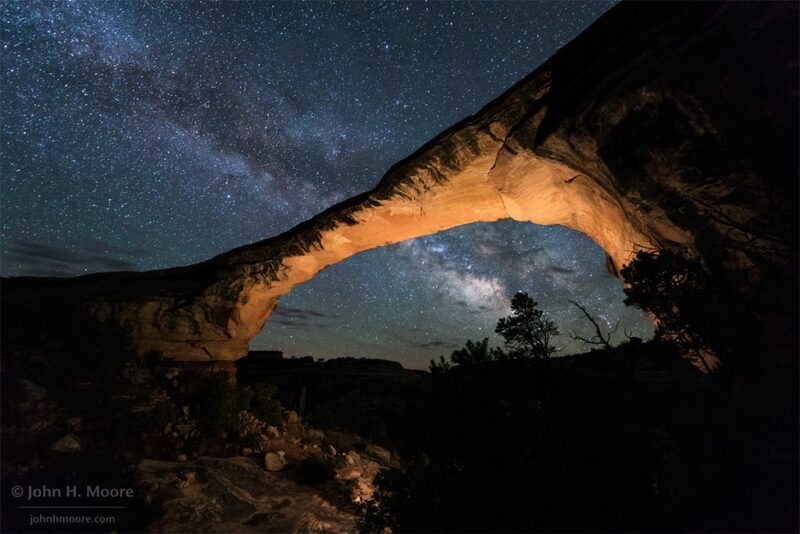 The Milky Way behind Owachomo Bridge in Natural Bridges National Monument. Utah, USA. 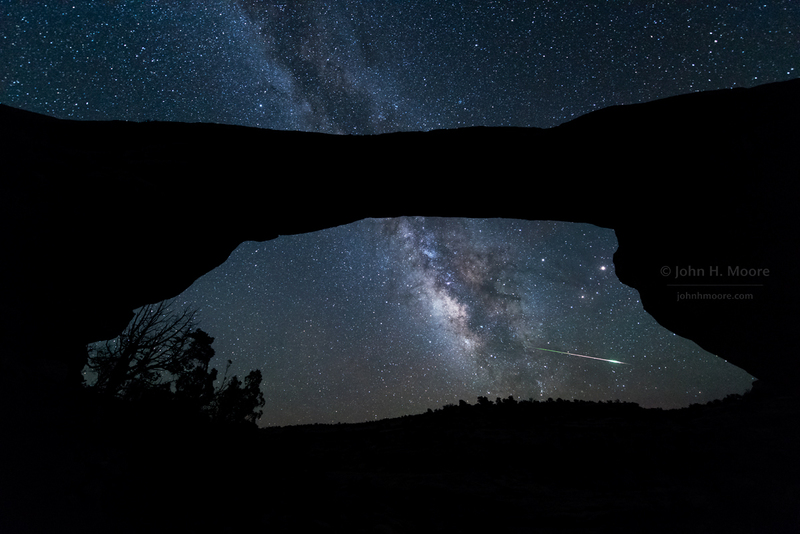 An Aquariid meteor explodes below Mars after streaking across the Milky Way on a clear, dark night in Utah. This entry was posted on June 25, 2017. It was filed under Nature, Night.